Sciens data advisory and analytics services plan and implement a wide variety of projects and help this organisation mature through the use of well planned and executed analytics strategies. Through analytics Sciens enabled business leaders to implement changes that enhanced customer experience and increase product and services uptake. Sciens advisory assessed existing analytics strategies to define a road map and delivery framework that aligned with business objectives and Sciens consultants were there to see it through. 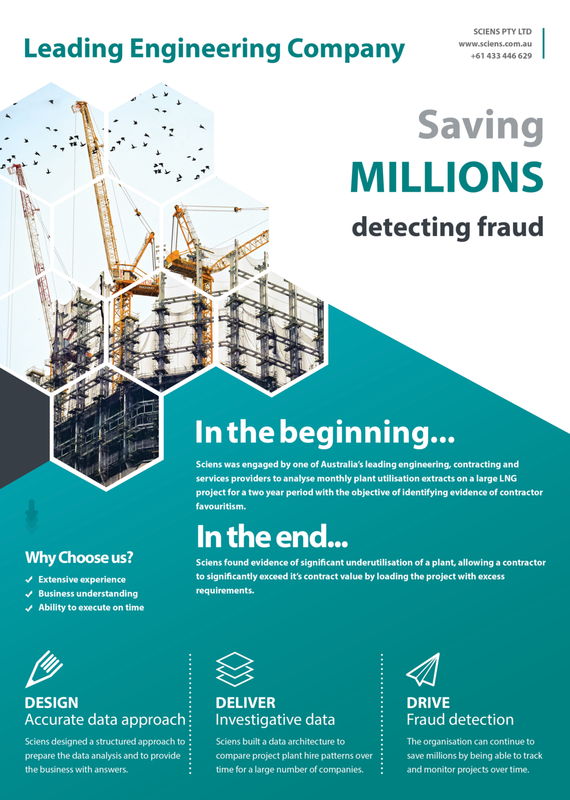 Through the implementation of behavioural analytics against transactions Sciens allowed this company to autonomously detect vendor fraud. Sciens helped this organisation by modelling complex risk factors through advanced analytics and then designing easy to consume dashboards to present the relevant and critical insights to the business leaders. Sciens conducted a deep data forensics exercise to uncover internal collusion though data evidence.